I’ve been a Dell advocate for at least 13 years now… Having bought a number of Dell machines for home use and having lost count of the many many Dell machines I’ve bought and used in a professional capacity. I’ve found them to be very reliable and the spec has always been good especially for high end developer PC’s. However, after years of being a satisfied customer my respect for Dell has taken a knock. I ordered an Alienware PC (a high spec gaming PC from Dell) in November. The order process was a good one with a promised delivery before Xmas (a box to tick on the web order form) and the estimated delivery date on their on-line order tracking site was set at 19th December. All good so far and I’m tweeting my pleasurable experience on twitterverse. Needless to say I was getting a bit concerned as xmas drew closer and my fear was justified when on the 16th December Dell sent an automated email from their manufacturing system saying revised delivery date was now 5th January. Obviously very disappointed to hear this as it is ‘the’ Xmas present for my son, so I call support at Dell. A very polite technician promised to investigate and get back to me same day. However, to add to my already disappointed state the technician didn’t get back to me. I have to say at this point someone promising to get back to me and then not just makes me annoyed. So now I’m disappointed and annoyed and as with my earlier tweets praising Dell, I’m now sharing my disappointment on twitterverse. A few days later @DellCares picked up one of my tweets and asked me to follow and DM my order details. They responded with DM and said they were expediting the order. Not wanting to appear stupid but I asked what that meant exactly. A day later I asked again and they said the order would be prioritised but they couldn’t guarantee delivery due to high seasonal demand. Now we’re two days past the original delivery date and I go to the web site to look for a new date and it’s still showing estimated delivery of the 19th December. So I followed up by phone to see if they have any more information. The technician was a nice guy from the Philippines who didn’t have any more information to share, but said as it’s been expedited we would be allocated an account manager to keep us updated with progress (we have never had one single piece of information from our designated account manager). So now its Xmas eve and I make another phone call and get an update to say the order has shipped and it could be with us by the 29th December… At last a bit of good news, I.e. whilst it didn’t make it in time for Xmas, there was a good chance it might arrive before new year. At this point I have to tell my son that his xmas present won’t be arriving on time but there could be a chance it could get here during the holidays. Xmas comes and goes and now it’s the 28th and we’ve still not heard anything more so I send a few more DM’s to @DellCares, no further information other than its shipped. However, upon checking the website there’s a tracking number is on there. A click through to the carrier reveals that it is being delivered by UPS and a glance down the screen reveals that it won’t arrive until 3rd January. As if this wasn’t disappointing enough the shipping date is actually the 28th December and not the 23rd December as previously communicated. This means that my countless phone calls and DM’s and the expediting (prioritisation) has come to nothing really. Anyway, I try ringing UPS to ask if they can deliver sooner. The lady on the phone is very honest and sincere (and very apologetic even though it wasn’t her fault) telling me that because the consignment is now on route they can’t change the priority. Whilst this is disappointing news to hear, I feel I am being treated well and appreciated the honesty. Before ringing off I ask if it could have been delivered sooner, and what I hear next was unbelievable… yes it could, there are a range of options including next day etc… but Dell have sent the order by the lowest possible priority that UPS support. Flabbergasted at this I contact @DellCares to ask how this can possibly be when they have expedited the order… to which they reply they expedited the production not the delivery!!!!!! UPDATE… Unfortunately it seems there is more to say after all. It’s now the 29th December and today I find out that only 2 of the 3 boxes in the consignment have been despatched. Another call to the call centre and yet again they are nice people but they can’t tell me what’s going on. UPDATE… 31st December … All my endeavours to expedite the order have unfortunately failed. The consignment (hopefully all three parts) is in a depot only 5 miles away and despite my efforts today I couldn’t get them to release it to me, so I’m going to have to wait until next week. If this should ever happen to you, and I hope it never does, then track down @DellCares as you’ll be wasting your time with the call centre. Very interesting read, I am curious if perhaps the specification you ordered contributed to the delay with the on going hard drive shortage. 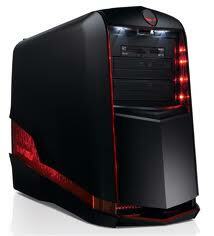 I wonder this because on December 5th I also placed an order for an Alienware (Aurora R3) and a Dell U3011. I received the monitor in three days, the computer was listed on the Dell support site to arrive by 12/19. On 12/16, I received an email from Dell saying it was delayed and should now arrive by 12/26. This was a problem as I really needed it for the holidays. I called Dell Order Support and asked if they could bump up the shipping from 5 day to 2 day, to possibly get it to me in time. Dell said it was too far along for the shipping method to be changed. It had a happy ending though, despite being told that they could not change shipping someone bumped it to next day (I think for free?) and when the computer shipped on the 19th it made it to me in New Hampshire by the 20th. I have been buying Dells now for about 10 years, and they do need to work out the kinks in support as my last purchase (XPS laptop) was also delayed and ultimately cancelled. Was glad to get the computer though. @Jeff Thanks for the comment… I’m glad it worked out for you in the end. I’m not sure where yours would heve been manufactured, here in Europe they’re assembled in Poland and I guess that adds to the shipping time. Looking back it seems the various departments within Dell weren’t joined up, and whilst this isn’t uncommon in large companies it doesn’t make the customer experience any better.